Donald Trump is not backing down, how refreshing! Today another organization, the PGA of America, distanced itself from Donald Trump in reaction to his campaign announcement speech references to illegal Mexican immigrants. “I love the Mexican people, but Mexico is not our friend“. “We MUST have strong borders and stop illegal immigration”. “Without that we do not have a country. Trump stated recently that he was surprised by the backlash and that his comments are causing financial concerns. Trump further stated Tuesday afternoon the loss of ESPN’s celebrity event, and NASCAR last week announcing it will not hold its season-ending awards ceremony at Trump National Doral near Miami, would be a financial benefit to him. He said he would keep the deposit from both groups and charge for someone else to use the ballroom and to play the golf course. “Two fees instead of one,” he said. “The crime is raging and it’s violent. And if you talk about it, it’s racist,” Trump told Fox News, three days after a purported illegal Mexican immigrant deported five previous times allegedly killed a woman in San Francisco. Trump said much more than the inflammatory remarks during his non-scripted, June 16 presidential announcement speech. How refreshing! Whether you agree or not, you have to love the fact that he says what he thinks, in a country where that is supposed to be okay, and then does not bow to politically correct language police and there demonizing attacks. Despite — or perhaps because of — such antics, [he] has rocketed into second place in recent national polls and in the early nominating states of Iowa and New Hampshire. Apparently others like the honest remarks, too. You don’t have to like his “in your face” style. You don’t have to like how he characterizes people. You can certainly laugh at his buffoonery. 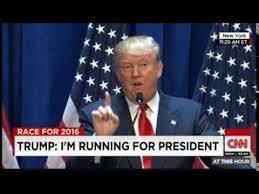 But, you have to like his honesty, backbone and statement of hard facts that concern many Americans (jobs, China, America’s reputation in the world, Obamacare, and immigration). If he keeps this up, he will serve an important role in the upcoming presidential campaign. Democrats will love to demonize him and the Republican party by association. On the other side, the country will hear the truth. That will be a challenge for the Republicans as the Democrats are much better at this kind of messaging.